Through the eyes of five-year old Clint Ferguson, Alaska’s Secret Door sweeps the reader via the Ferguson family’s canoe into the Athabascan culture of the Yukon River. Leaving behind both the Tanana River and the road system, the Fergusons pass through a seemingly invisible door and discover the sweeping river highway, the artery into the heart of Alaska. At Ruby, the Fergusons meet the unforgettable Mary and Paul Peters and their son, Emmitt Peters, winner and record-setter, of the 1975 Iditarod Trail Sled Dog Race. Through the Peters family, Alaska’s Secret Door is a child’s intimate portrayal of fish camp, smoked moose hides, native ice cream, wind, sand and salmon. From paddlewheels to the shaman’s exotic kazhem at Shageluk, Secret Door is a child’s door into Alaska’s fantastic plethora. 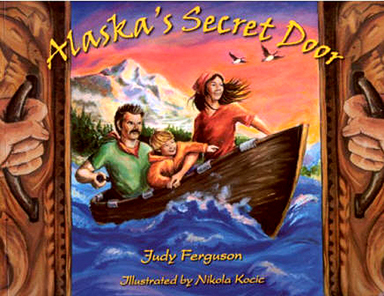 Alaska’s Secret Door--Written by Judy Ferguson; illustrated by Nikola Kocic; published by Glas, Secret Door is the Athabascan people’s presentation of the Interior’s history, geography and culture, shared with a young boy and his family. 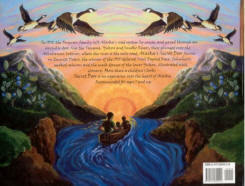 Alaska’s Secret Door: In an Alaskan Van Gogh style, Kocic has powerfully depicted the subtle hues of Alaska's sky, land and water in the light of the Midnight Sun; non-fiction; 38 pages; fine arts, coffee table, children‘s book; paperback; glossary; photos of persons portrayed; maps.